The French cartoon character, Asterix, is an enduring symbol of French nationalism. In the comic, a medieval Gaul named Asterix defends his village from the Romans, all the while having comic misadventures throughout the world with his massive companion Obelix. Asterix has been the star of dozens of video games, movies, cartoon specials, books, comics, and has even had his face featured on bags of chips, advertisements, and all sorts of other things. 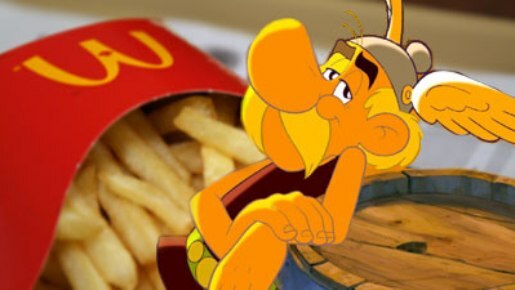 However, McDonald’s is where France draws the line, as a McDonald’s ad featuring Asterix has caused an uproar. The ad, by advertising agency Euro RSCG, depicts the traditional village feast in Asterix’s time, but with Coca-Cola and Big Macs instead of mead and wild boar. The ad was done with the full cooperation of Asterix co-creator Albert Uderzo and the studio behind the Asterix comics, and Asterix was even the replacement for Ronald McDonald in several French McDonald’s ads in 2001. But THIS TIME, it goes too far and France is MAD! Unless, of course, there’s a super-sweet Asterix Happy Meal on the horizon.